Experience the desert sky...inside and out! Welcome to Southern Nevada’s only public planetarium, where the stars are literally the stars of the show. Our 66-seat theater features an Evans & Sutherland Digistar 5 high definition hemispheric video projection system that creates virtual realities on an impressive dome surrounding the audience. We present different events and shows to the general public on weekends and to local schools on weekday mornings. In addition, the Las Vegas Astronomical Society calls our planetarium home, and the CSN college astronomy professors use the facilities during introductory astronomy courses. The Astronomy Store features all types of astronomy related products for sale when patrons purchase their planetarium tickets. From posters, models, astronaut ice cream and fruit, scientific toys, model rocketry materials, Space Pens and astronomical observing aids, the store provides a wide selection of fun, educational items for kids and adults alike. Friends of The Planetarium receive a 10% discount. The Planetarium is located on CSN's North Las Vegas Campus, one mile east of the I-15 / Cheyenne Rd. interchange in North Las Vegas. Please note that north is to the left on the map. Programs are presented every Friday at 6 pm, 7 pm and 8 pm and every Saturday at 3:30 pm, 6 pm, 7 pm & 8 pm. Presentations start on time and there is no late seating. All programs are approximately one hour in length. Seniors over 55, children under 12, active military, and students of CSN qualify for the discount price. Youth groups, where one person buys all of the tickets, also qualify for the discount price. Please see our group reservation policy. Student Appreciation Night: On the first Friday of each month, The Planetarium presents free admission to either the 6 pm, 7 pm or 8 pm performance with a valid CSN Student ID. If you do not have a Student ID Card yet, visit the Student Government area on any of the three main campuses of CSN. The Big Dipper Program: For our regular customers. Give us your e-mail address and receive a Big Dipper card. For each ticket you buy, get a star punched on the Big Dipper card. Once all seven stars in the Big Dipper are punched, receive a free ticket and a new card. Your e-mail address will only be used to announce new shows and special events at The Planetarium. Evening at The Planetarium: Spend the entire evening at The Planetarium. If you buy tickets for both of two consecutive shows, you can get the second show tickets for half price. If the weather is clear, stay a little longer for free telescope viewing after the 8:00 pm show. After 8 pm performances, the telescopes at the Student Observatory will be open for viewing when the weather is clear. onOrbit magazine is made possible, in part, by donations from the Friends of The Planetarium. To become a Friend of The Planetarium, please send your tax deductible donation to the address above using our convenient application form. For more information, please inquire in the Astronomy Store on show days or call 702-651-4505 during regular business hours. School field trip presentations consist of one or two planetarium programs. You may choose any two of our shorter programs (up to 25 minutes in length each) or one of our longer programs (from 26 to 41 minutes in length). 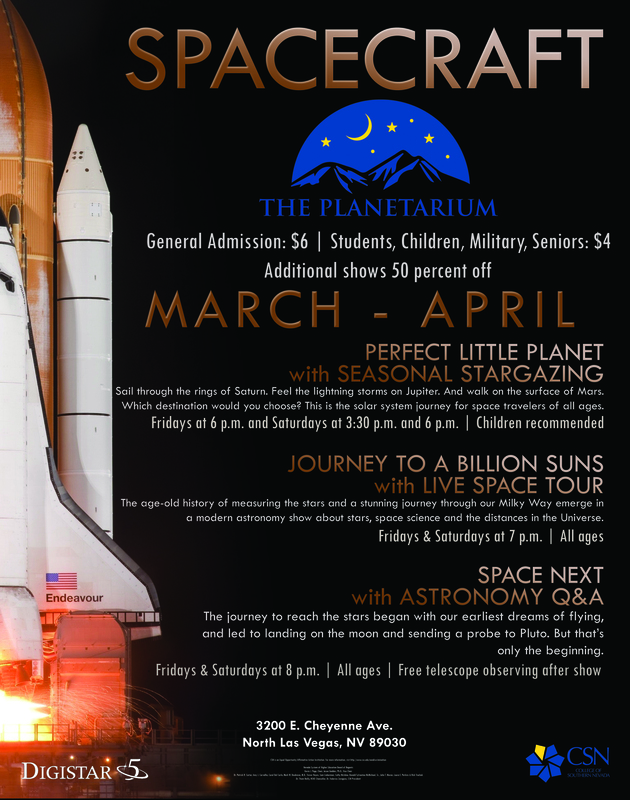 Each program is followed by the the current edition of our seasonal presentation, Stargazing. Stargazing presents the latest information about the locations of the current evening stars and constellations. Total show time varies from 45 to 60 minutes, depending on the selection. Time is allotted for student questions. Teachers receive up to 10 free passes to public shows for use as student incentives and are provided to teachers when they arrive for their field trip presentation. School shows are offered at 9:30 am and 11 am every week, Monday through Friday. To schedule a show please call 702-651-4138, during regular business hours. The Planetarium has a maximum seating capacity of 66 people. The admission price is $2.00 per person (students and adults). There is a minimum fee of $50 (up to 25 people) and a maximum fee of $100 (50 or more people) for each presentation. The Planetarium at CSN operates the NASA Regional Educator Resource Center for the State of Nevada. The Planetarium at CSN, in cooperation with the NASA Ames Research Center, operates the Nevada Regional Educator Resource Center (NRERC). The NRERC maintains curricular materials and lesson plans for K-12 teachers primarily in the areas of Space Science and Astronomy. Teachers are encouraged to come to the center and copy any of these public domain materials. These materials include print media, audio tapes, slides and video tapes. Startup funding for the NRERC was provided by the Eisenhower Mathematics and Science Higher Education Grant Program. Satellite Tracking. This site provides ground track and visibility information on several satellites including the International Space Station and the Hubble Space Telescope. NASA's Educational services are available from NASA Education. Nathan Smith at the Utah State University Educational Resources & Technology Center has created a useful set of links. NASA's JPL has recently posted a new electronic book on The Basics of Space Flight. The Space Telescope Science Institute features the latest images from the Hubble Space Telescope. The latest information on the Galileo Mission at Jupiter is available from the Jet Propulsion Laboratory. Jet Propulsion Laboratories has a collection of many of the best images from NASA's exploration programs. An electronic version of Science Magazine is available at Science Online. The Physics Department at the University of Oregon has posted an interesting web page about the newly discovered planet circling the star 51 Pegasi. Try the online orrery called Solar System Live. onOrbit is published by The Planetarium every month. We began publication in January, 1989. onOrbit replaced the Southern Nevada Sky Calendar which was published from 1977 through 1988. In July, 2001, we began joint publication with the Fleischmann Planetarium and Science Center in Reno, thereby expanding our service area to the entire State of Nevada. In Reno, onOrbit replaced the Fleischmann Flyer. It is sent to all Friends of The Planetarium and Friends of the Fleischmann Planetarium. onOrbit is also available by subscription at $12/year. Have you ever had a specific astronomical question that Google couldn't answer for you? The Planetarium at CSN has a team of expert astronomers and astrophysicists available to answer any question that you may have. Click to Contact Uswith your astronomy questions. 1. Why is Pluto not considered a planet? Answer: In 2006, the International Astronomical Union declared that they would no longer consider Pluto a planet because it has not cleared its orbit of debris and other rocky material. Their declaration that this disqualified it from planetary status has received mixed reviews, with many planetary astronomers disagreeing with the IAU statement. In fact, NASA is proposing a counter definition for a planet after their exploration of Pluto with New Horizons. While NASA is trying to go through the proper channels within IAU to change their definition, the definition of a planet is not something that that IAU has unilateral discretion to determine. They have merely declared themselves the arbiters of all space related decisions without having the true authority to do so. Answer (by Dr. Stephanie Fiorenza): As of right now, we can see space out to about 15 billion light years. A light year is the distance that light travels in one year. So what that means is that space is really, really big! It is possible that there is stuff in the universe that's even farther away from the stuff we can see right now. The trouble, though, is that we will probably never get to see these things because space is growing bigger and bigger, and more and more quickly, every moment! So if there are extra things in space that are too far away for us to see, we probably will not ever get to see them because space keeps pushing them farther and farther away from us. What this means is that we really don't know for sure when space ends. You asked a question that still stumps even the smartest astronomers, Ari! I hope that maybe one day, someone (editor's note: Or even you Ari, when you become a scientist) will come up with a better answer to your question.